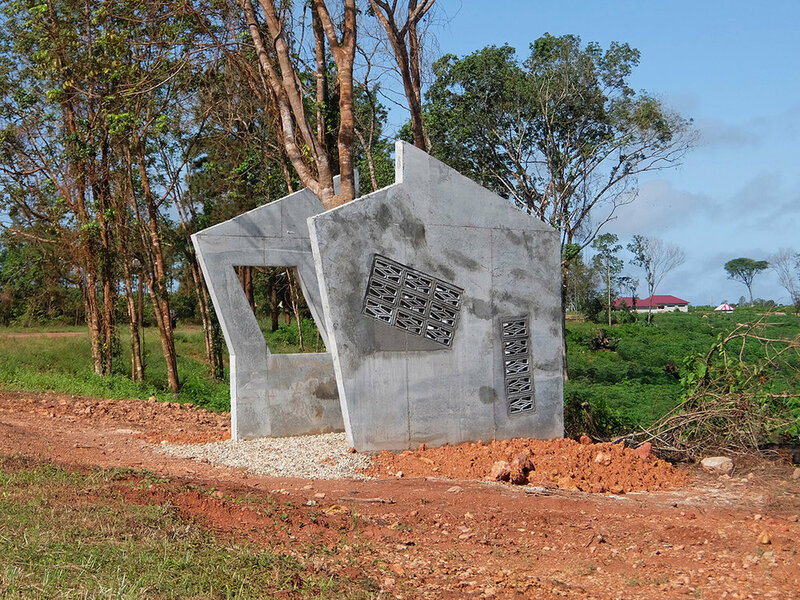 Beckers realized the sculpture Afu-Osu (Aukan for "half house") while being an artist in residence at Tembe Art Studio in Moengo, Suriname from March to June 2016. During his stay he noticed the many unfinished homes in Moengo. Although unfinished, these building were no failures. In conversations with their owners Beckers found out that building a house in Suriname is simply a slow process than can sometimes take up to ten years. An unfinished house in Moengo is therefor not a failure, but merely a very slow success. As a reaction to this Beckers also attempted to build a house during his stay, whose architecture is inspired by houses found in Moengo and the house that Buster Keaton builds in his film One Week (1920). In contrast to the other homes that are being built in Moengo, Beckers' attempt was no slow succes, but a direct failure. Because not only does the house have no roof and are the walls and windows crooked, it was also built around a tree. Thanks to Marcel Pinas, Donovan Pramy and Subema N.V.